The spiky modules used to build this curving pavilion in Stuttgart, Germany, are made from a bioplastic containing over 90 percent renewable materials (photography by Roland Halbe). 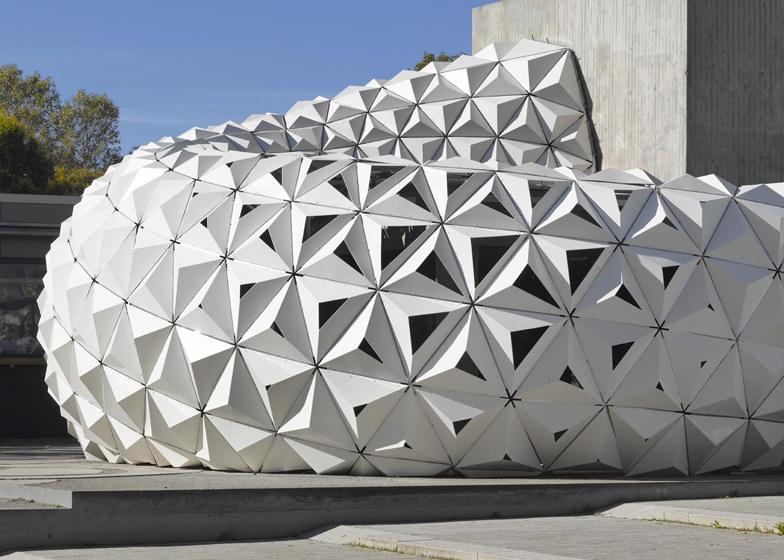 Students and professors from Stuttgart University's ITKE (Institute of Building Structures and Structural Design) designed the freeform facade to demonstrate the structural properties of a new bioplastic developed specially for use in the construction industry. Bioplastics are plastics made from renewable biomass sources such as starches, cellulose or other biopolymers, that offer sustainable alternatives to plastics derived from fossil fuels. The bioplastic used in the ArboSkin project is called Arboblend and is produced by German firm, Tecnaro, by combining different biopolymers such as lignin – a by-product of the wood pulping process – with natural reinforcing fibres. "Thermoformable sheets of bioplastics will represent a resource-efficient alternative [to oil-based plastics, glass, or metal] in the future, as they combine the high malleability and recyclability of plastics with the environmental benefits of materials consisting primarily of renewable resources," explained the project team. The pyramidal modules are made by extruding bioplastic granules into sheets before thermoforming them to create the faceted shapes and trimming off the excess material. The double-curved skin is formed by linking the pyramids together, with bracing rings and joists helping to create load-bearing walls. CNC-milling was used to remove sections from some of the modules, creating apertures in the facade. The waste material from this process can be re-granulated and fed back into the production process, while the plastic sheets can be composted at the end of their life. Mock-Up: The bioplastics facade mock-up was created within the framework of the Bioplastic Facade Research Project, a project supported by EFRE (Europäischer Fonds für Regionale Entwicklung / European Fund for Regional Development). 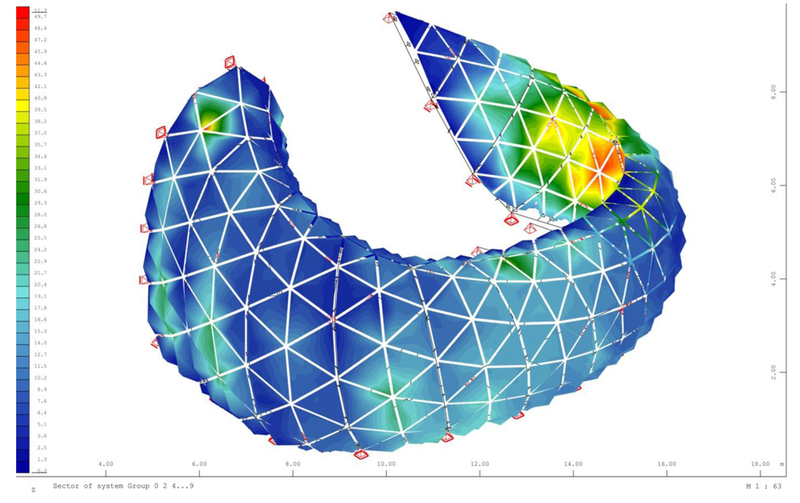 It demonstrates one of the possible architectural and constructional applications of bioplastic materials developed during the course of the project. The blueprint is based on a triangular net composed by mesh elements of varying sizes. Bioplastic Façade Research Project: The ITKE has many years of experience in teaching and research in the fields of computer based design, simulation, and production of cladding for buildings with complex geometries. Currently, materials made from oil-based plastics, glass, or metal are mainly used to encase these structures. Thermoformable sheets of bioplastics will represent a resource-efficient alternative in the future, as they combine the high malleability and recyclability of plastics with the environmental benefits of materials consisting primarily of renewable resources. The interdisciplinary group of material scientists, architects, product designers, manufacturing technicians, and environmental experts was able to develop a new thermoformable material for facade cladding made primarily from renewable resources (>90%). Developed by project partner TECNARO within the framework of the research project ARBOBLEND®, a special type of bioplastic granules was employed, which can be extruded into sheets and further processed as required: the sheets can be drilled, printed, laminated, laser cut, CNC-milled, or thermoformed to achieve different surface qualities and structures and eventually produce various moulded components. The semi-finished products serve as cladding for flat or free-formed interior and exterior walls. The material can be recycled and meets the high durability and flammability standards for building materials. The goal of the project was to develop a maximally sustainable yet durable building material while keeping the oil-based components and additives to a minimum. The ecological audit was completed by project partner ISWA (Institute for Water Engineering, Water Quality, and Waste Management). Furthermore, the material’s resistance to microbial degradation was also determined. Innovative Character of the Research Project: This research project marks the first occasion for the development of bioplastic sheets primarily based on renewable resources. The sheets can be freely formed, are designed for applications in the building industry and are specifically meant for building exteriors and cladding. At the beginning of the project such product was not available on the market. The conception of this material as flame-retardant sheet material also aims at applications for building interiors (spek DESIGN). With this new development, we can therefore soon offer a product that addresses two trends: - the increasing demand for resource-efficient and sustainable building materials - the increasing development of buildings featuring double-curved geometries and planar facade components with 3D effects (relief).